Opening up a new business is an expensive endeavour, that doesn't always leave much room for office furniture. If you need a quick, temporary solution, design firm Our Paper Life has created the perfect alternative called Room in a Box. 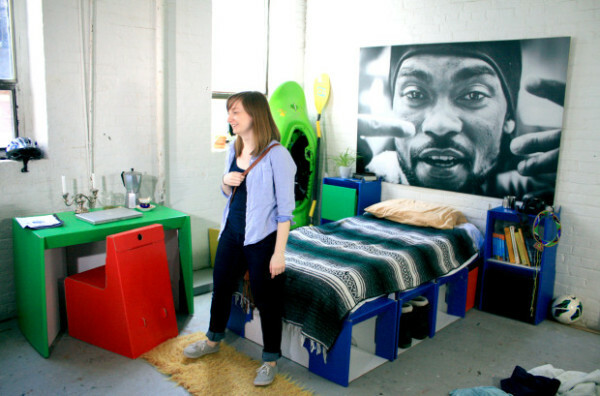 The company will mail a wheeled cardboard box to you, full of an entire room of furniture made out of cardboard. The delivery will include a folding desk, a chair, a wastebasket, and 12 cubes that you can use as shelving, or you can use your imagination and design your own piece for furniture using the cubes. Our Paper Life also says that the furniture is very easy to set up -- the entire thing is said to be completed within 10 minutes without the help of glue, tape or tools. Plus, the cardboard itself is laminated to make it water-resistant, and the pieces come in array of colours -- blue, green, red and yellow. It seems Our Paper Life's target demographic is students about to move in to their first dorm room. However, I see many other uses for Room in a Box. Think inexpensive coworking spaces, temporary offices, or an expansion of a home office. You can pre-order your own Room in a Box for $149.